Learn more about Chandeliers by Watching a Video! Where should I hang a modern chandelier and what finishes and shapes are available? These lights provide a touch of glamor and charm to hallways, living room, and kitchen. The decorative ceiling-mounted light fixture serves as an eye-catching focal point that can add a touch of elegance and sophistication to any room. Our chandelier collections come in a variety of shapes such as abstract, cylindrical, cluster, or globe. All of the chandeliers are available in a range of finishing such as gold, chrome matte, brass, nickel, aluminum, black, and white, which you can select according to your budget and preferences. What brands can you recommend? 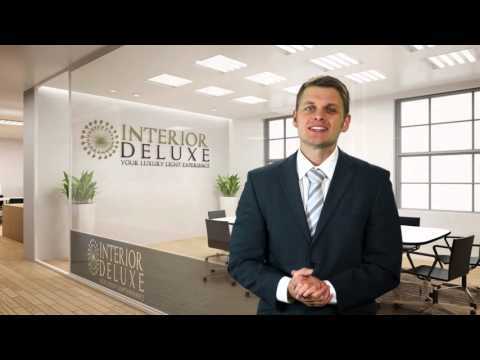 You can find an extensive selection of chandeliers at Interior-Deluxe. We stock a broad range of modern chandeliers from internationally renowned lighting brands such as >Anthologie Quartett >Schuller > Helestra > Holtkotter >Tobias Grau >Vertigo Bird, and many others. The branded chandeliers come in a variety of sizes and styles all of which look elegantly suave and charming at the same time. What forms are available and can you name and depict some of your most favorite models ? We provide different types of chandeliers including Contemporary chandeliers, Transitional chandeliers, Traditional chandeliers , Murano glass chandeliers, Crystal chandeliers , Chandeliers with LED, and Large Chandeliers. There are so many varieties of chandeliers in our stock that you will be spoilt for choice as to which one to purchase for your home. Our collection of modern chandeliers provides an ideal combination of sophistication and design. For instance, Drop 5100-196 Light Cluster Chandelier - 19 Lights from Alma Light that was designed for ALMA Light by Christian Cuniña feature a transparent glass structure that looks both traditional and suave at the same time. Then there is the Rain chandelier from Anthologie Quartett chandelier that features Swarovski crystals and mirror finish steel structure. You won’t find such elegantly designed chandelier anywhere else. The light looks fit for a palace due to its ostentatious and grand appearance. If you want a chandelier that looks elegant and stylish yet traditional, consider Jahreszeiten chandelier - spring silver from Anthologie Quartett. The chandelier can be redecorated according to different seasonal themes such as ice age, winter, summer, autumn, and spring. Our LED chandeliers can perfectly complement modern look and décor of a house. Our collection of futuristic looking LED chandeliers will sure to amaze your guests with their elaborate and out-of-this-world designs. Consider, for instance, Mercury chandelier | Suspension from Artemide that appears as like droplets of mercury suspended in the air. Designed by Ross Lovegrove for Artemide, the chandelier is made of aluminum die cast with the reflective units made of molded thermoplastic material. The lighting fixture looks ultra futuristic as you can see floating assembly of pebbles that bounce light between their bio-morphic surfaces. Another example of a great looking LED chandelier is the Spillray 30 Chandelier - LED from Axo. This red chandelier is made of glass and metal featuring different colored finishes such as red, orange, transparent, and gray. The fixture is illuminated by 30 LED lights that look breathtakingly beautiful when hung on the wall. The design of The Light 5150 suspension lamp from Alma Light was inspired by the lightings of the 70s. The chandelier boasts of multiple iron arms all of which are at different heights. At the end of each arm are two LEDs. One of the LEDs is for lighting purposes while the other serves as indirect lighting. This chandelier is ideally suited for large spaces such as restaurants or hallways in hotels. We have an extensive collection of Murano Glass Chandeliers that boasts of elegant design and futuristic look. You can find a plethora of glass chandeliers made by reputable designers for a different internationally renowned brand. AVMazzega’s Foscari 8003/18 18 Lights Chandelier is one such glass chandelier that looks breathtakingly beautiful and elegant in any room. Another great Murano glass chandelier is the Ca'Pesaro 8008/03 3 Lights Chandelier from AVMazzega. This elegantly designed chandelier is a timeless Venetian chandelier that looks classy and charming at the same time. Each lamp of the chandelier is an example of perfect craftsmanship that has made Murano glass famous all over the world. What’s best about this chandelier is that it can be molded according to the desire of the customer reflecting their desire and passion for all things beautiful. Two other great Murano glass chandeliers include the Magia 9011/06 Chandelier and Oblivion 10012/P7 7 Lights Chandelier. Both of these chandeliers feature excellent craftsmanship. The Venetian chandeliers look great in any room that customers can also customize as to their liking. The natural elegant look of these chandeliers makes them perfectly suitable for contemporary themed homes. Crystal chandeliers are extremely popular among the customers mainly due to their elegant and stately crystal component. You can find an assortment of crystal chandeliers in our collection. Probably the finest example of an elegant crystal chandelier is the Coco 80 Chandelier - Round from Brand Van Egmond. This elegantly designed chandelier feature crystal clear and deep black crystal offering a pleasing contrast. Delphinium 140 Chandelier - Round is another great crystal chandelier from Brand Van Egmond. The light features iron garlands that carry glass elements in an elegant manner. It features a nickel finish and large curviform crystals that look great from any angle. One of the most elegantly designed crystal chandelier in our collection is Night In Paris 8 Chandelier from Ilfari. This chandelier features clear glass with silver inside. The gorgeously looking chandelier is available in different finishing including Bronze, Chrome, Satin Brass, Brilliant Brass, and Matt Nickel. It can beautify the overall look of any room including kitchen, living room, or office meeting space. For a futuristic and elegantly designed chandelier, you should consider Sprankling Disk XXL Chandelier from Ilfari. This great chandelier is available in multiple finishing that you can select as per your preferences. In case you fancy a chandelier with chic design and elegant look then you will certainly like Loves Comes Again Chandelier from Ilfari. This uniquely designed chandelier greatly adds to the look and theme of a room. Still not sure which Chandelier to buy? Modern chandeliers are real works of art—breathtaking in design, spectacular in form and function. The classic, timeless elegance of these contemporary lighting fixtures is apparent at first glance, as they transform each space into something remarkable. Our extensive selection of contemporary chandeliers includes pieces to suit every modern home décor theme, with lighting solutions ranging from simplistic and chic to ultra-modern and gothic.